A pilot’s fundamental responsibility is to prevent a loss of control (LOC). Loss of control in-flight (LOC-I) is the leading cause of fatal general aviation accidents in the U.S. and commercial aviation worldwide. LOC-I is defined as a significant deviation of an aircraft from the intended flightpath and it often results from an airplane upset. Maneuvering is the most common phase of flight for general aviation LOC-I accidents to occur; however, LOC-I accidents occur in all phases of flight. To prevent LOC-I accidents, it is important for pilots to recognize and maintain a heightened awareness of situations that increase the risk of loss of control. Those situations include: uncoordinated flight, equipment malfunctions, pilot complacency, distraction, turbulence, and poor risk management – like attempting to fly in instrument meteorological conditions (IMC) when the pilot is not qualified or proficient. Sadly, there are also LOC-I accidents resulting from intentional disregard or recklessness. To maintain aircraft control when faced with these or other contributing factors, the pilot must be aware of situations where LOC-I can occur, recognize when an airplane is approaching a stall, has stalled, or is in an upset condition, and understand and execute the correct procedures to recover the aircraft. Within the above parameters, but flying at airspeeds inappropriate for the conditions. The reference to inappropriate airspeeds describes a number of undesired aircraft states, including stalls. However, stalls are directly related to angle of attack (AOA), not airspeed. To develop the crucial skills to prevent LOC-I, a pilot must receive upset prevention and recovery training (UPRT), which should include: slow flight, stalls, spins, and unusual attitudes. Upset training has placed more focus on prevention— understanding what can lead to an upset so a pilot does not find himself or herself in such a situation. If an upset does occur, however, upset training also reinforces proper recovery techniques. A more detailed discussion of UPRT to include its core concepts, what the training should include, and what airplanes or kinds of simulation can be used for the training can be found later in this section. Figure 4-1. Coordinated flight in a turn. A pilot should develop a sensitivity to side loads that indicate the nose is not yawed into the relative wind, and the airplane is not slipping or skidding. A correction should be made by applying rudder pressure on the side toward which one feels a leaning sensation. This will be the same side to which the ball in the slip/skid indicator has slewed (i.e., the old saying “step on the ball”). The angle of attack (AOA) is the angle at which the chord of the wing meets the relative wind. The chord is a straight line from the leading edge to the trailing edge. At low angles of attack, the airflow over the top of the wing flows smoothly and produces lift with a relatively small amount of drag. 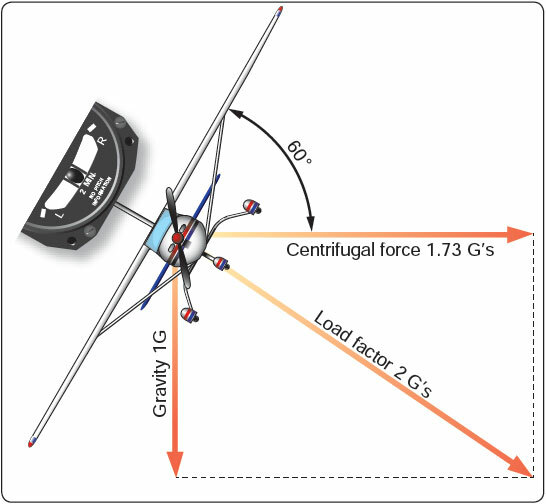 As the AOA increases, lift as well as drag increases; however, above a wing’s critical AOA, the flow of air separates from the upper surface and backfills, burbles and eddies, which reduces lift and increases drag. This condition is a stall, which can lead to loss of control if the AOA is not reduced. It is important for the pilot to understand that a stall is the result of exceeding the critical AOA, not of insufficient airspeed. The term “stalling speed” can be misleading, as this speed is often discussed when assuming 1G flight at a particular weight and configuration. Increased load factor directly affects stall speed (as well as do other factors such as gross weight, center of gravity, and flap setting). Therefore, it is possible to stall the wing at any airspeed, at any flight attitude, and at any power setting. For example, if a pilot maintains airspeed and rolls into a coordinated, level 60° banked turn, the load factor is 2Gs, and the airplane will stall at a speed that is 40 percent higher than the straight-and-level stall speed. In that 2G level turn, the pilot has to increase AOA to increase the lift required to maintain altitude. At this condition, the pilot is closer to the critical AOA than during level flight and therefore closer to the higher speed that the airplane will stall at. Because “stalling speed” is not a constant number, pilots must understand the underlying factors that affect it in order to maintain aircraft control in all circumstances.